Eastbourne Borough winger Dean Cox in action during his loan spell at Burgess Hill Town. Picture by Steve Robards. Burgess Hill Town host National League South side Eastbourne Borough tonight hoping to seal a place in the Sussex Senior Cup semi-finals. The Sports sit 15th in the division-above having taken 35 points from 30 games. Jamie Howell's side have only won twice in 2019, with both victories coming within the first five days of the new year. The Hillians have been on a torrid run of form themselves, having suffered five defeats in the past six games, leaving them one point adrift of Bostik Premier safety. Burgess Hill have so far overcome Bexhill United and Pagham in the competition to reach the quarters, while Eastbourne Borough have notched up victories over local rivals Eastbourne United, and Horsham. Both sides boast a number of players and staff coming up against their former club. Hillians midfielder Steve Sargent had a spell at the Sports, while boss Simon Wormull made 29 appearances for Borough in the 08/09 campaign, scoring two goals. 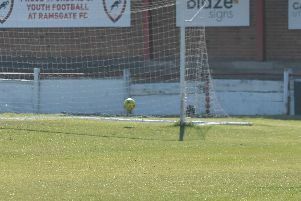 Eastbourne winger Dean Cox, who recently extended his contract at Priory Lane, had a short-term loan spell at Burgess Hill from Crawley Town during the 16/17 season, netting once in five games. The winners of the tie between Hill and Borough will meet Bostik South East side Haywards Heath Town in the semis at Lancing's Culver Road, with the fixture due to take place on Wednesday February 27 or Tuesday March 5. This is a rearranged quarter-final tie after the game on January 22 was abandoned due to a floodlight failure. If you have a ticket from the original fixture, you can present it at the turnstile for free admission. Season tickets and 400 Club tickets are not valid this evening. Kick-off tonight at the Green Elephants Stadium is at 7:30pm.